You might wonder what Indy is doing in the forty-first millennium, but seems Games Workshop had a serious thing for the archeologist producing not one but THREE homages to the character. Left to right: “Idaho Smith” from the Gothic Horror range; “Archaeologist” from the Talisman Timescape expansion; and “Bandit” from the Rogue Trader Adventurers range. I’d like to get some more displaced 20th century archaeologists to accompany Indy on his field trips. The Citadel Gothic Horror range has both a Vicar and a Reverend that would work well as antiquarians, and a couple of Kathleen Kenyon lookalikes. The possibilities are endless when you’re hunting for something as mundane as a civilian in slightly muddy clothing. Indiana Jones and the Great Crusade. 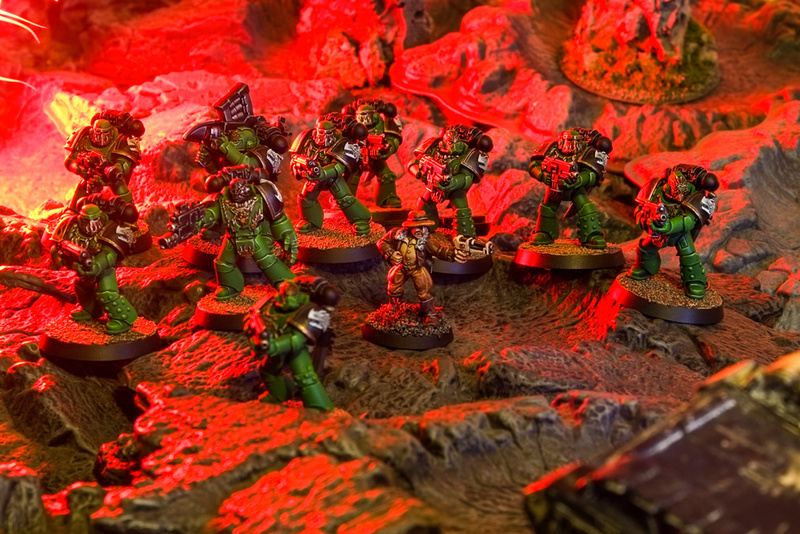 All this recent blogging and photography has highlighted the main terrain I have is cardboard Space Crusade pieces. To remedy this I picked through my storage crates and unearthed a polystyrene Chaos temple. Teenage Curis went through a Slaanesh phase and badly repainted the flagged flooring in a veiny purple marble. It looked awful and was hidden away for decades. I borrowed insipration and techniques from cheetor’s recent Age of Sigmar pieces. The result is fairly plain, and I feel I need to pick out the odd brick in different colours – but it was gloriously quick to spray and drybrush. Most of the work was adding extra sand and rubble texture to cover the old factory-applied bright green static grass and damaged areas. It’s given me the confidence to tackle more terrain, perhaps the Battle Masters tower next. I believe the fact many of the guys in the studio being into archeology or at least History might have helped making the character popular. I think that guy couldn’t ask for a more fitting colour scheme and the blatantly xenos gun works wonders. Thanks JB. I’d like to do a second one with a different gun. I was thinking it could be a Chaos pistol with a skull worked into the casing. Call it “Indiana Jones and the Pistol Skull”. Cracking work on Indy. The title pic is great, it looks like he’s leading those marines to some long lost artifact. I’m really proud of the title pic! I stayed up till 2am trying to balance all those Salamanders on their stupid big bases correctly on the crates. And a painted Battle masters tower? Something to look forward to… everyone has one of those, right? My Saturday’s just beaten me to the punch with the Battle Msters tower! Hee hee. Good idea. The Talisman Timescape version has a whip, that’s a great rules implementation. Smashing bit of paint there Curis. That’s one fine archaeologist. He of course needs a few more companions…a squat wearing a fez? A ratling in a baseball cap? Of course, then there’s the dodgy looking companion who attempts to double-cross him in the beginning! That terrain piece is a fine bit of work too. It’s amazing how much improved terrain is with addition of a little sand. Fanks axiom! 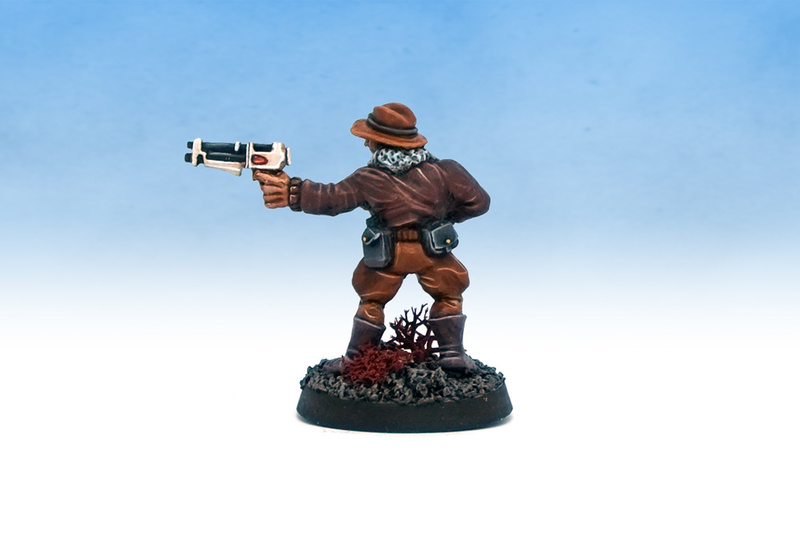 I am getting a bit of an itch to paint some Arabian type space people for several reasons including Indy pastiche characters. I’ve got a Marauder Arab Villager on its way in the post as I type this. A particularly luscious post this time Curis, fab work. I had forgotten that foam terrain piece even existed. 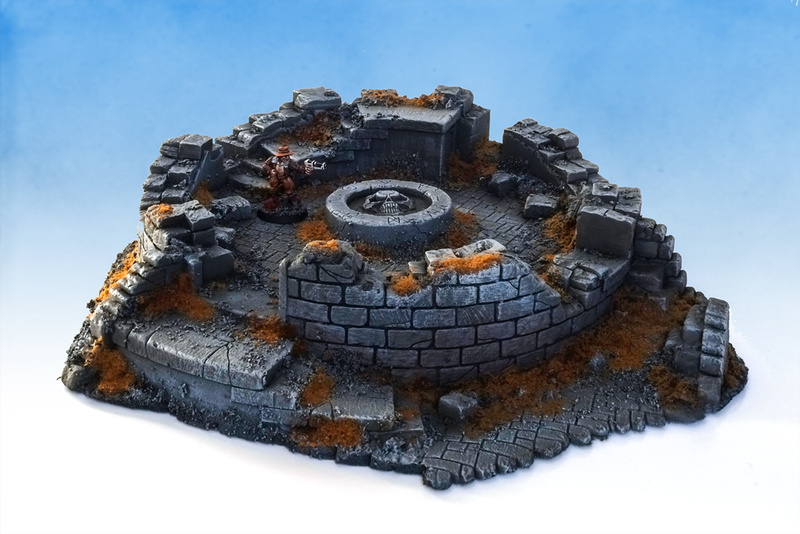 I think that I get it mixed up with similar LotR terrain pieces from around then. Indy-with-a-laspistol is a particularly well suited character to hang out with The Doctor of course. The various techno-savage figures in the Adventurer range all fit in nicely in Doctor Who. 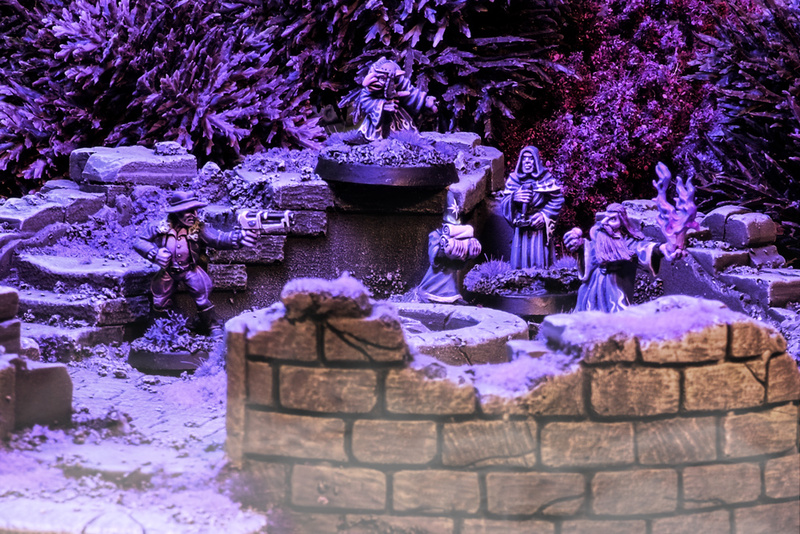 They really were superb terrain pieces from a product design point of view. Lightweight, prepainted and very game-friendly with all those flat surfaces. Archaeologists and Doctor Who go together so well! Just been watching the Pertwee The Daemons episodes, which start with BBC3 televising a archaeological dig on a barrow. Nice! 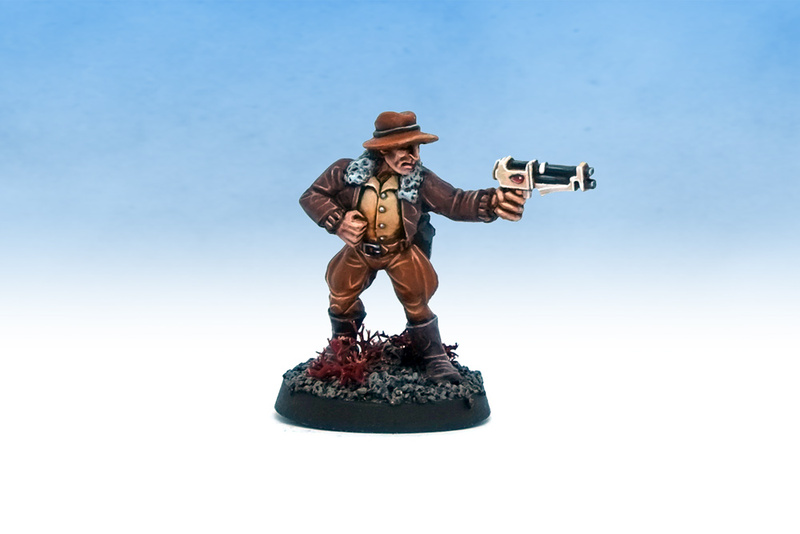 I actually have the “Adventurer with bolt pistol and power sword” guy out of this range, bought him as a “rogue trader” model in the late 90’s / early 2000’s. When were they originally released? He was a release in White Dwarf 118 (October 1989). I have one of him too, but sadly the Powersword is missing. Have you painted yours? I’m working on him currently for a custom shadow war armageddon Inquisition team. He’s about 70-80% done through.